What is it with Lady Liberty and taxes. 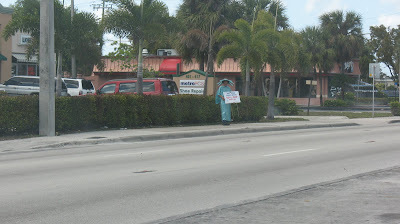 Saw this guy on a south Florida street corner; he wasn't exactly drivin' in the customers. But why are tax preparers always associating themselves with the Statue of Liberty? After all, the saying isn't: "Give me your tired, your poor, your huddled masses yearning to get their taxes in on time." That reminds me. Good thing we're leaving for home today. I've gotta file my tax return! But that's what the Statue of Liberty would be saying now! She has to make a few bucks, too, the oil in her torch doesn't come cheap these days. Lidian: Her Canadian counterpart (who would that be anyway?) will get more from me than I'd like. Mere: I'm with you. It's a taxing job (pun intended) but someone's gotta do it.